It seems like almost every year Apple crows that the latest iOS update is the greatest one yet. Yes, when you incrementally add features and fix bugs, every new version is fundamentally better than the previous one. But iOS 11 is more than that: This is a substantial upgrade that dramatically transforms iPad productivity while offering a host of new features that have the potential to make the world around us both safer and more entertaining than ever before. The hype is justified. iOS 11 is Apple’s most ambitious iOS update in some time. Editor's note: This review has been updated with links to articles that take you deeper into specific iOS 11 features. The new setup feature of iOS 11 saves you time by transferring some data directly from one device to another. The day you buy a new iPhone or iPad should be a time of joy. 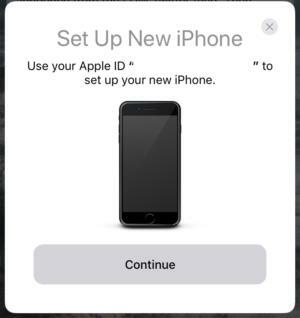 Instead, it’s frequently a frustrating exercise in entering in passwords repeatedly while tapping through a long series of questions about activating or deactivating numerous iOS features. Apple’s been gradually improving this process over the years, but it takes a big step forward with the new auto-setup features in iOS 11. In iOS 11, you can transfer key features (including settings, preferences, and your keychain passwords) directly between devices by pointing your old iPhone’s camera at the new model, which displays a pattern that allows the two devices to pair with each other wirelessly and begin transferring information. When all was said and done, I still needed to restore my iCloud backup and reload apps from the App Store, but the process was measurably smoother than ever before. Assuming that everyone updates their old devices to iOS 11 before buying new iPhones, this year’s iPhone upgrades should be much smoother for new phone buyers. 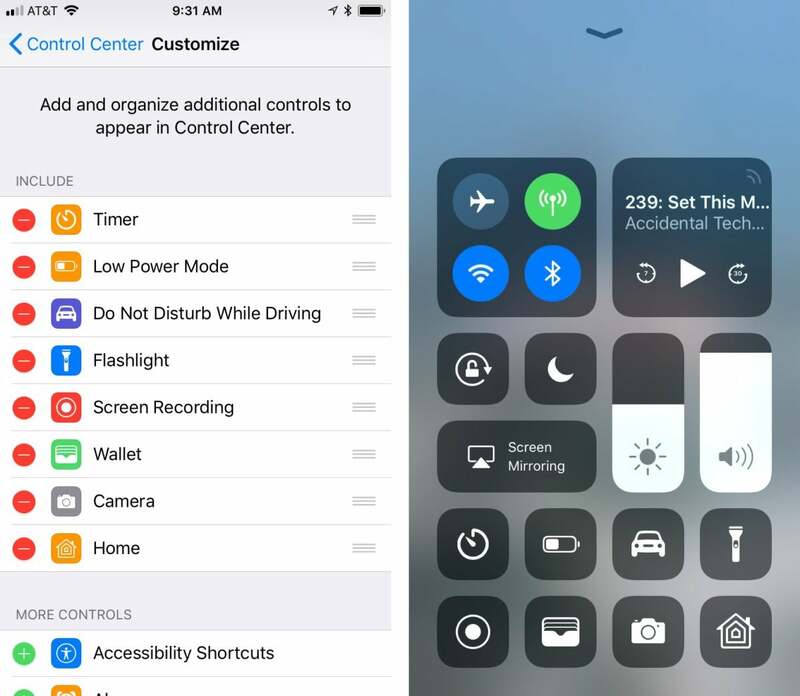 Control Center, the interface that lets you make quick changes to your iPhone with a quick swipe up from the bottom of the screen, is completely redesigned in iOS 11. Gone is the old three-page interface, replaced with a single page of icons, buttons, and sliders. You can customize Control Center now—for example, to add a button to enable Low Power Mode or remove the button for HomeKit. Most of the buttons also provide additional features if you 3D Touch them (or tap and hold if you’re not on a 3D-touch-capable device). The new Control Center (right) is customizable via the Settings app (left). With iOS 11, Apple has addressed one of my biggest complaints with notifications on my lock screen and in Notification Center by bringing them in to alignment with one another. With iOS 11, the lock screen and Notification Center are merged together, with the current time, currently playing audio, and current and recent notifications, all scrollable. I used to “lose” notifications after unlocking my phone, and they wouldn’t be visible in Notification Center, but that seems to be all fixed now. The App Store app is completely redesigned, with a large feature area containing articles about apps, and a simplified app detail screen. Perhaps the most important part of iOS as a platform is the App Store, so it’s understandable that Apple has been reluctant to mess with success. But with iOS 11, consider it messed: The App Store app has been completely redesigned. There’s a new visual look (inherited from the iOS 10 design of Apple Music), with big banners and large, graphic-rich boxes. 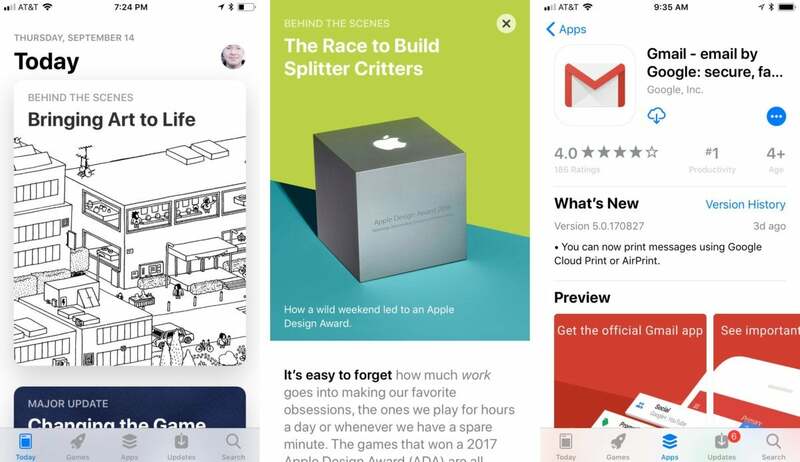 But more impressive is the editorial commitment Apple is making, with full-on articles spotlighting the app and game of the day, as well as other featured items. In iOS 11, the App Store is a richer, more fun experience—and, I suspect, a more effective tool for selling us more apps. This is a great feature that’s bound to save lives and prevent traffic accidents. It’s so easy to be distracted while driving, especially by the avalanche of push notifications that our apps send to us regularly. The allowances for call and text overrides are helpful, so I can know that my family can reach me when I’m driving even if I’d prefer not to be bothered by anyone else. While Apple could’ve added many more settings for this feature, I’m glad that it kept things simple. 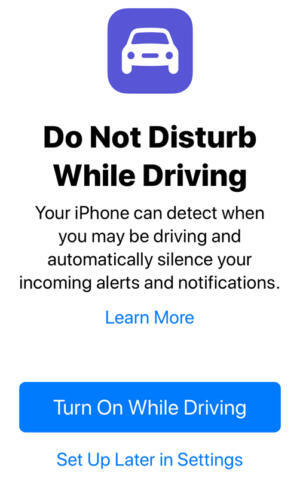 You can’t set apps to break through, for example, and I think that’s Apple’s message that no app notification is worth creating a distracted driver. Some iOS 11 changes are a little more subtle. The Apple News app is more personalized in iOS 11, with support for a “spotlight topic.” If you frequently hold your iPhone in one hand, there’s a new one-handed keyboard layout that pushes all the keys to the left or right side of the screen, so your fingers can reach every key—even on the emoji keyboard. (You bring it up by tapping and holding on the emoji/keyboard button; to return to a normal keyboard, just tap the arrow at the large empty area.) This is an especially nice feature on the larger iPhone Plus models. You can activate the one-handed keyboard (right) via a new element at the bottom of the keyboard picker (left). Apple has added a bunch of features to iOS 11 that aren’t particularly new, even on iOS—but now that they’re integrated into the core apps that come with iOS, they’ll probably find a wider audience than did before. Notes now has a document-scanner mode that will automatically detect the edges of a piece of paper held in front of your device’s camera and use those edges to intelligently crop and adjust the image so that it looks more or less like you scanned it on a flatbed scanner. 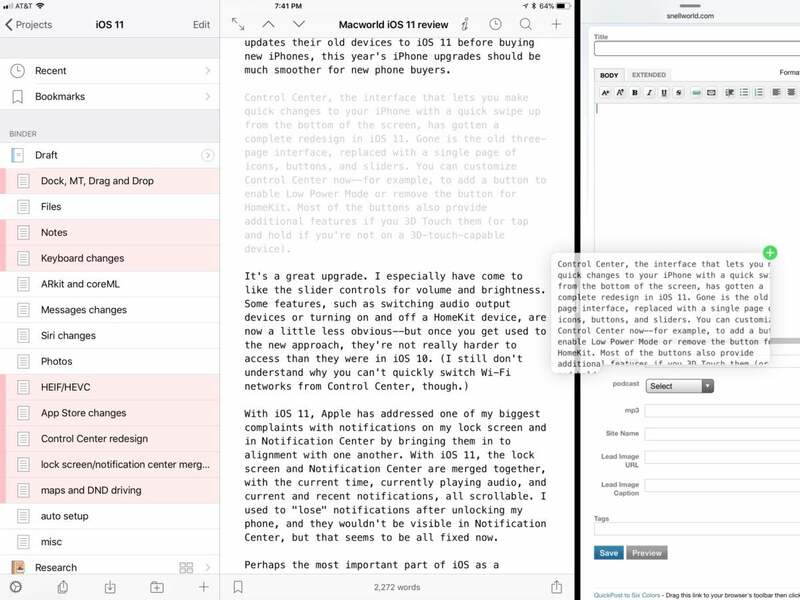 Notes also now includes OCR (optical character recognition) technology, so when you scan or hand-write text (rather than typing it on a keyboard), your device will figure out that text and make it searchable. The Maps app is adding lane guidance, which is a welcome addition—but also one that Google has offered in Google Maps for some time. You can now set the behavior of a double-tap on the left and right AirPods separately, so (for example) tapping on the right AirPod advances to the next track while tapping on the left one plays or pauses audio. Most iOS features arrive fully formed, but there’s a whole category of features that won’t reach their potential for a little while, because they rely on outside app or hardware developers to support them. ARKit, Apple’s framework for augmented reality apps—apps that can take a live image captured by your device’s camera and then place virtual objects into that space and display the mixed result on the screen—has the potential to be huge. This fall we’ll be inundated with AR apps, most bad, some mind-blowingly good. There’s huge potential here, but we’ll need to see how app developers respond to this new technology over the next few months. Apps like PCalc (left) and Carrot Weather (right) have been updated to include AR features. 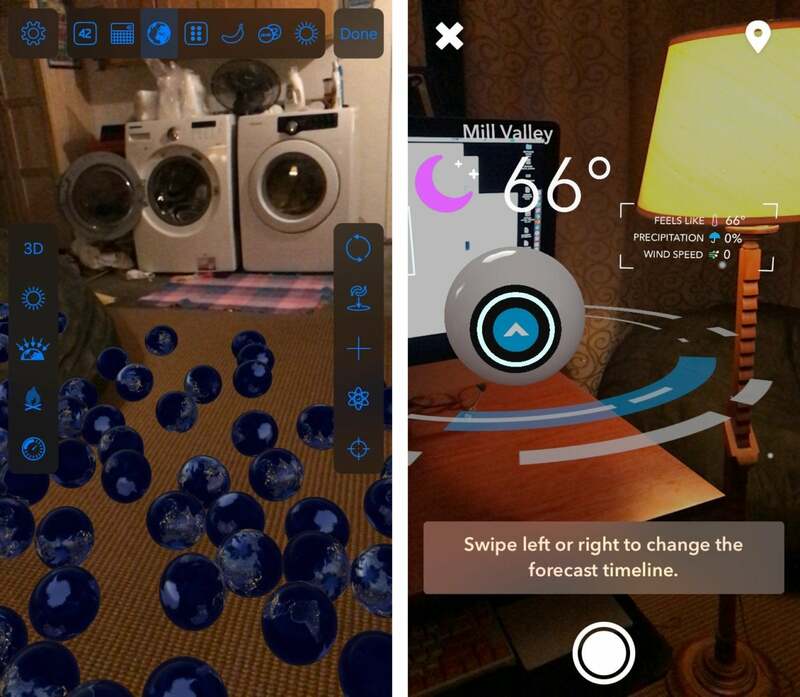 Other AR applications both silly and useful will fill iOS devices this fall. Similarly, the new Files app looks great. It’s essentially an update of the old iCloud Drive app that has expanded its horizons. It’s a full-fledged file browser, so if you’d like to manage files on your iOS device, you can. (If you don’t want to, you don’t need to! Unlike Finder, which is at the center of the Mac experience, Files is an app like any other, and if you never open it, you’ll basically never see it.) Third-party apps can hook into Files, which means that every possible cloud-storage service you can think of—Dropbox, Box, Google Drive, OneDrive, even SFTP and SMB servers—should be able to hook into Files and appear as a peer to iCloud and local storage. This will be a big deal for professionals who need to store and manage files in the cloud—but I’m reserving judgment until I see which players properly support it, and how well it works in practice. 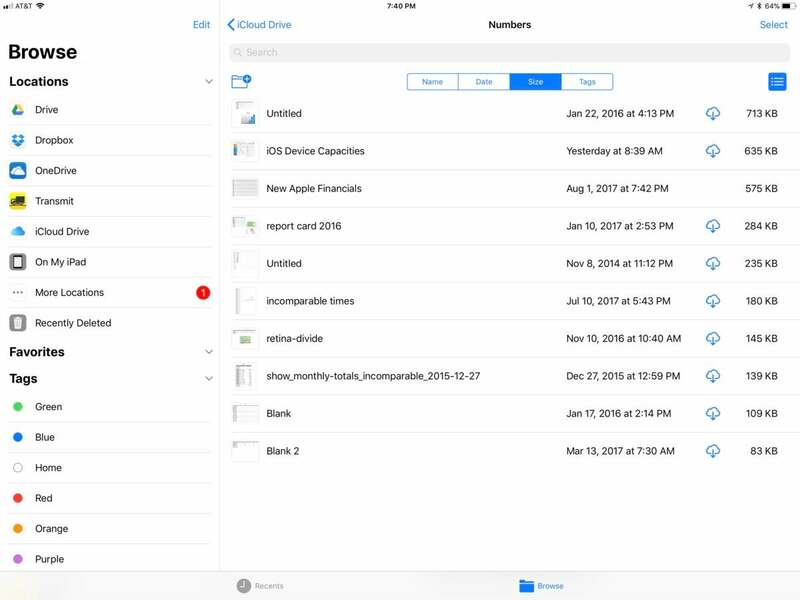 The iOS 11 Files app is a file browser for iCloud Drive and other cloud services. Finally, there’s AirPlay 2, Apple’s latest iteration of its device-to-devices media streaming protocol. The proof in AirPlay 2’s quality will be in how well it interacts with hardware, both from Apple and from other manufacturers. Only then will we know if AirPlay is a boon or a bust. Some of the most dramatic changes in iOS 11 are limited to the iPad. 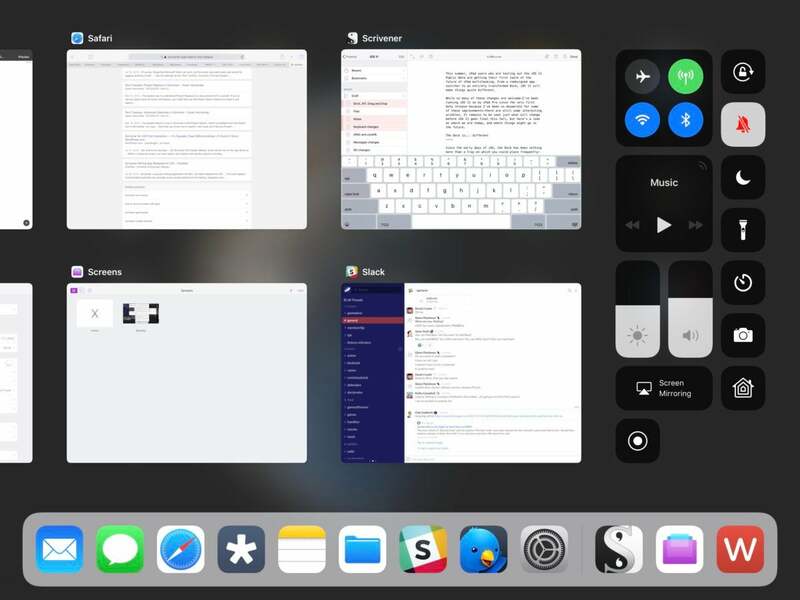 It’s been two years since the last iOS update to feature prominent iPad-only features, and this year Apple has tweaked many of the multitasking features introduced in iOS 9. This update also brings numerous other iPad-focused features, whether you’re an Apple Pencil user or someone who tends to focus on the software keyboard. The iOS 11 multitasking view on an iPad, complete with a new Dock (bottom) and the redesigned Control Center (right). Two apps side by side in iOS 11, with the Dock swiped up at bottom and the Files app providing quick access to recent files. iOS 11 lets you drag and drop items between apps—but only on the iPad. iOS 11 brings true drag-and-drop functionality to the platform for the first time. For iPhone users, this feature is limited to dragging data around within an app. But on the iPad, you can drag data between apps. It’s a great feature, though apps have to be updated to really take advantage of it. This feature actually surpasses my expectations, because not only can you drag items between on-screen apps, you can actually begin dragging data and then use the multitasking view to move to a different app, then drop it there. That’s a multi-finger gesture that’s a little complicated to execute, but it feels natural—and it opens every single app on your iPad to dragging and dropping. 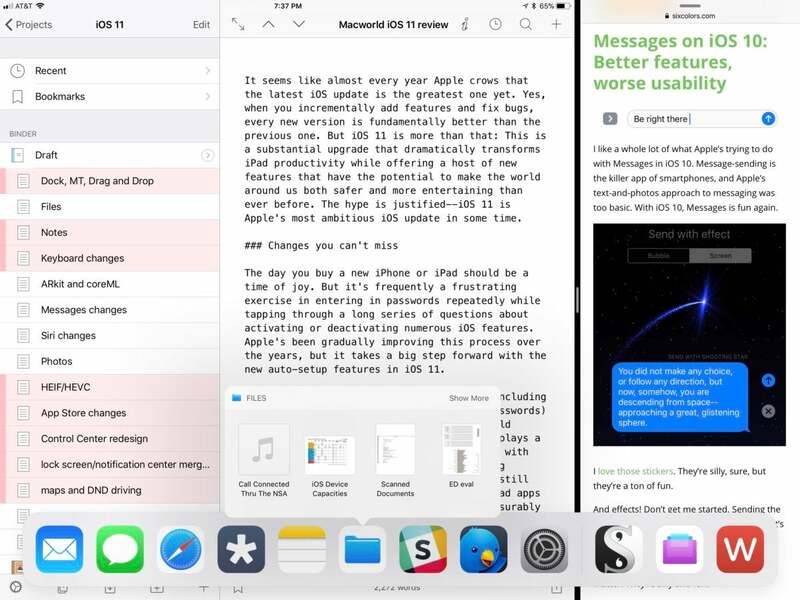 It’s another huge boost for iPad productivity. 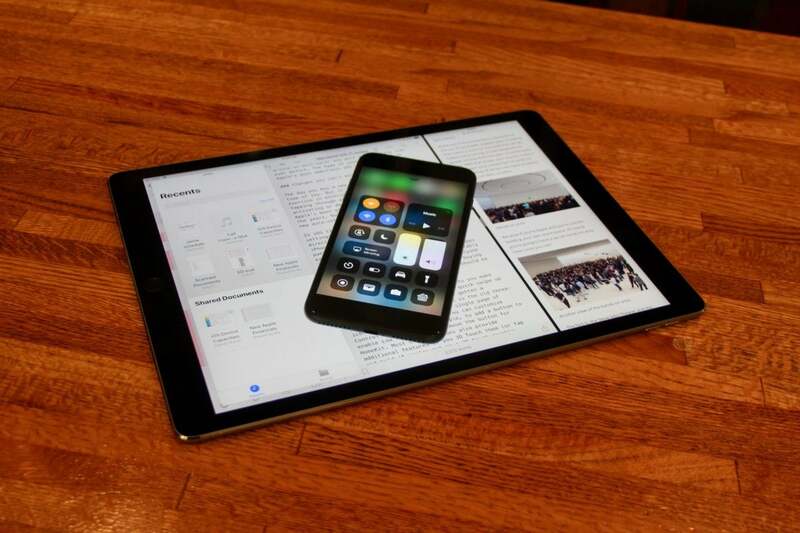 There are a few other great changes that iPad users will love. You can now set Notes to open automatically when you tap on the lock screen with an Apple Pencil, which essentially turns your iPad into an on-demand notepad. And on the 9.7-inch and 10.5-inch iPads, the new QuickType keyboard lets you type a second characters by tapping with a slight downward swipe. Once you get used to it, it makes typing symbols and numbers far more fluid than when you had to toggle to a different keyboard, tap a key, and then switch back to the standard set of letters.